Developing classroom community is another brick in the foundation of classroom management. It’s the old “One for all and all for one” adage at work. We’re all in this together. We spend the whole day together and I see those kids more than many of them see their own parents. We really are a little family for 7 hours every day. So how do we get the kids to be a positive, contributing member of that family each day? How do we get them to care enough about us and each other to really want to do what needs to be done to make the day go smoothly? Build those relationships with Love, Respect, Fairness, and Trust. And that is true. Kids will never make the effort to truly BE a part of the classroom community if they think it doesn’t matter. They will just be in the classroom each day and not care if they have a negative effect on the space or not. And I’m not talking about plain ol’, run of the mill, love. I’m talking about unconditional love. That really hard, ‘I absolutely love you no matter what, even when you’re being awful’ love. I have a 3 year old son and anyone who has had experience with a 3 year old knows they usually tell it like it is! Here are a couple of interactions we had recently on the topic of love. We were riding in the car and out of the blue, that sweet little voice from the back seat calls out, “I love you, Mommy!” Awww! How sweet is that!? “But, sometimes I don’t.” Ouch. Thanks for your honesty kiddo. Joe: I don’t love you! Me: That’s, okay. I love you. Joe: Well, I don’t love you. You’re naughty. Me: I’m sorry you’re upset. But I still love you. Even when you’re naughty. Joe: I will love you when you’re nice! (Imagine that cute little grumpy face and those sweet, pudgy little arms crossed! But, these conversations reveal the key to unconditional love that our kids don’t always understand. I love you all the time. Even when you’re naughty. My hope is that once kids know that I care about them, they will care about me and hopefully, each other. My hope is that if I truly and honestly show unconditional love to my students they will learn to show love for each other. Loving them doesn’t mean giving in to them and letting them run the show. Ultimately, the show is mine. I am always the ringmaster. But in loving them, I stop and listen to what they have to say, ask about things they like and do, provide materials and activities they enjoy, laugh with them, provide a lovely classroom space, hold their hands, hug them, make eye contact, tell them they’re awesome, and show them respect. Stayed tuned tomorrow for RESPECT! I totally agree! Every kid needs to feel loved and need to know that you genuinely care. Can't wait for the next post! Nikki, I loved this post. I am currently teaching Science in my K-2 Primary building. I see a lot of kids in a day and even more than that in a week's time. In the spirit of love, I have made it my goal to learn everyone's name this year, and to learn something about each one. I know that will be a challenge, but I know that in the end it will be a win win situation. They will know that I care and I will know that they have learned something because I care. Your points are spot on. 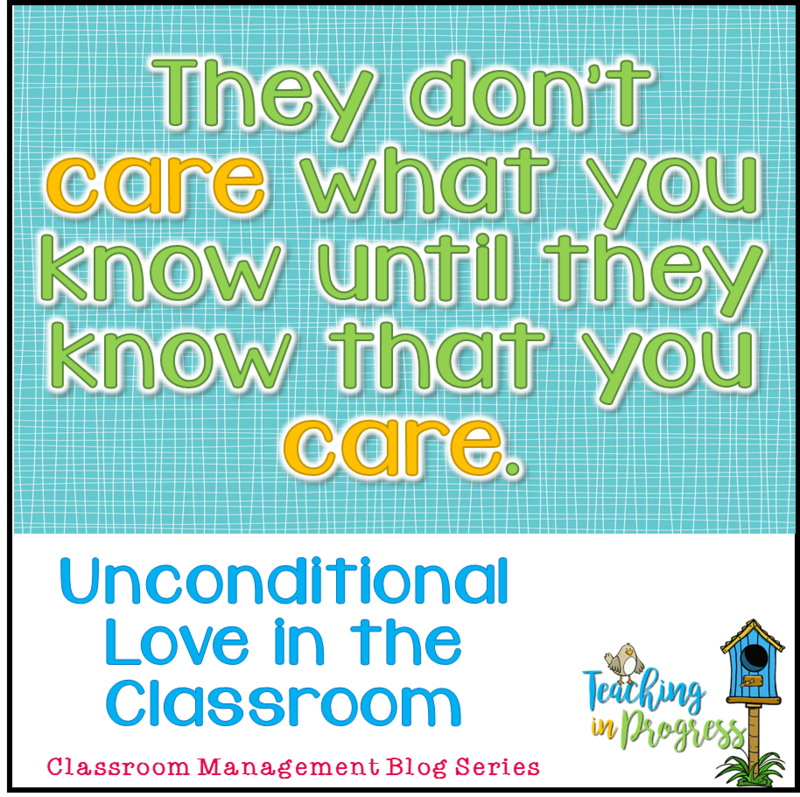 Something happens when a teacher loves unconditionally and the kiddos believe it. That is quite a challenge, but I am positive it will be worth it! Sounds a lot like Love and Logic. Great post! I think I may have to read that! I am reading your blog as a newly trying to home school mom NON educator who grew up in a family of teachers, and now married to one. You guys are SOOOO important and I thank you for this attitude. Your kids are SO lucky to have you for teacher with this attitude!